After an incredibly successful season, four members of the Buffalo Beauts have earned 2019 NWHL Awards – Shannon Szabados, Goaltender of the Year; Blake Bolden, Defender of the Year; Maddie Elia, Most Valuable Player; Hayley Scamurra, The Players’ Top Player of the Year. Scamurra received the honor from the NWHL Players’ Association – the first time the league has awarded an MVP and Players’ Award (as the NHL does with the Hart Trophy and the Ted Lindsay Award). The MVP, Goaltender of the Year and Defender of the Year were selected by a panel of 20 broadcasters and reporters in cooperation with the Women’s Hockey Media Association. In her first season in the NWHL, international superstar Szabados was lights-out for the Beauts, making countless big-time saves. Szabados tied for the league lead (with Buffalo goalie partner Nicole Hensley) with two shutouts in the regular season, posting a 1.49 goals-against average and a .934 save percentage. Szabados helped the Beauts allow the fewest goals in the league this season, with just 25 goals against in 16 regular season games. In addition to being stellar for the Beauts, Szabados captained her NWHL All-Star team to victory in both the skills competition and All-Star Game. Szabados was selected as Goaltender of the Year from among three finalists, with Boston’s Katie Burt and Connecticut’s Meeri Räisänen. Bolden returned to the NWHL this season and joined the Beauts for the first time, helping bolster Buffalo’s defensive corps. Bolden made her presence known on both sides of the ice with the Beauts, helping Buffalo post four shutouts in the regular season on the defensive end while tying for the league lead among defenders with 13 points (1-12-13). She also returned to the NWHL All-Star Game, reclaiming her Hardest Shot title with an 80 mph blast. The other finalists for Defender of the Year were Minnesota’s Lee Stecklein and Amanda Boulier. Former Boston College and Boston Pride teammate Lexi Bender added, "Blake is a great hockey player and better person. She is someone that I have looked up to since I stepped foot onto the BC campus and she is so incredibly deserving of this award! Congrats, Blake!" Elia took home the Most Valuable Player (as selected by the media) over finalists Jonna Curtis of the Minnesota Whitecaps, Amanda Kessel of the Metropolitan Riveters, Gigi Marvin of the Boston Pride and Räisänen of the Whale. Elia led the league with 12 goals in 16 regular season games, finishing with 19 total points. Elia posted a whopping seven multi-point performances, including a four-point night in a 4-0 win over the Minnesota Whitecaps on Dec. 30. 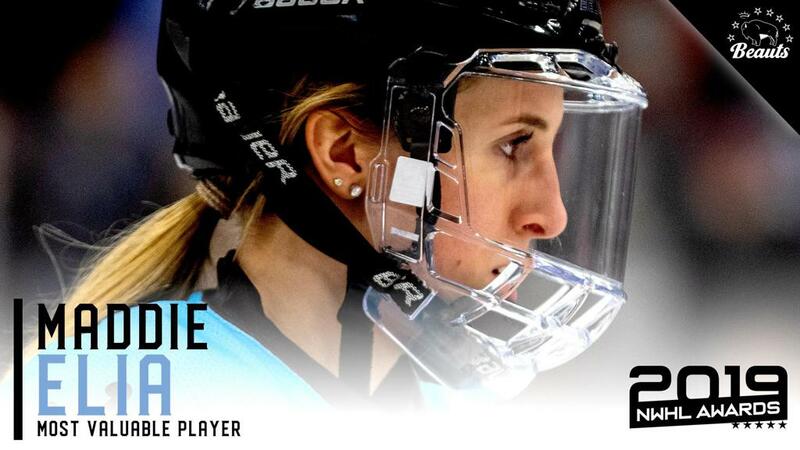 She was named VEDA NWHL Player of the Week for her efforts. In addition to her individual success, Elia helped her line, with Scamurra and Dani Cameranesi, become arguably the most dangerous trio in the NWHL. Scamurra was named The Players’ Top Player, voted on by the NWHLPA. Scamurra’s stats speak for themselves, as she led the league with 20 points (10-10-20) in 16 regular season games. Scamurra posted five multi-point performances, including a pair of four-point outings. She also netted a pair of game-winning goals and finished the season with a plus-16 rating. A longtime teammate of Elia’s, the two seemed nearly unstoppable for most of the season, as they finished as the top two scorers in the league. Scamurra’s play in the NWHL this season also helped her earn her first call-ups to the U.S. National Team. This season was a memorable one for the Buffalo Beauts, an organization that has set a standard for professional women’s hockey in North America. These awards represent the incredible accomplishments of each individual, as well as the Beauts program as a whole. 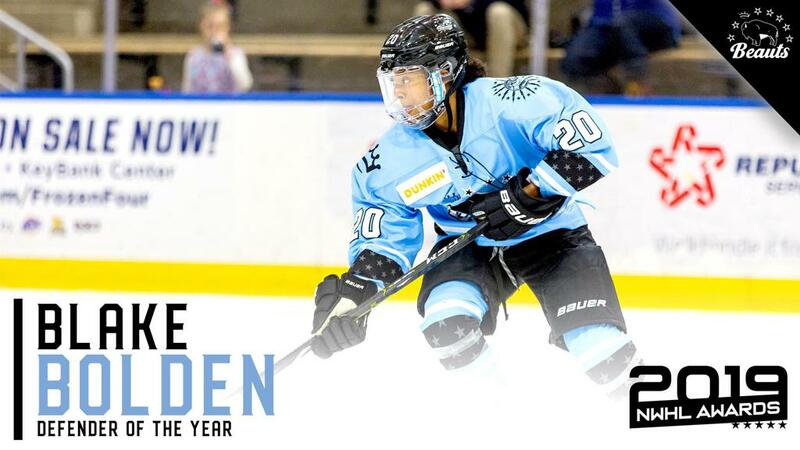 The NWHL extends its congratulations to Bolden, Szabados, Elia, Scamurra and the Beauts.